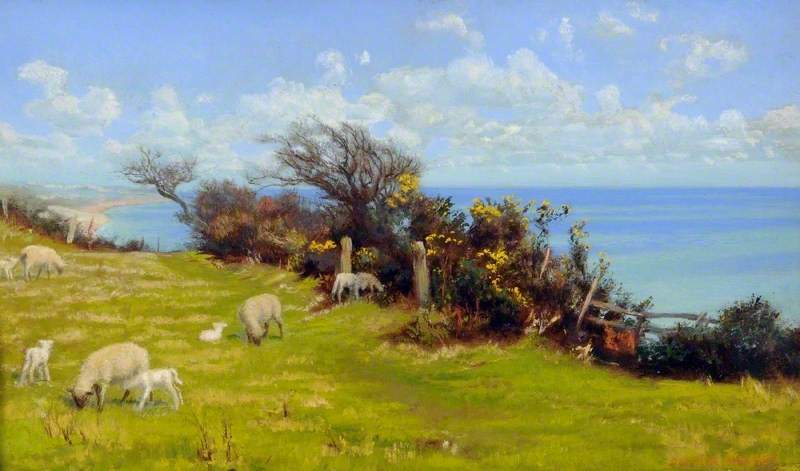 This is one of those "engagingly fresh landscapes, forming the bulk of [Hughes's] only important one-man exhibition, held at The Fine Art Society in the summer of 1900" (Wildman). Hughes had been supplementing his meagre income as an artist by examining work produced by students in the national School of Art system, which was based at South Kensington. But he went away as often as he could on painting expeditions to the West Country. In this way he accumulated enough work for the exhibition. He was not as popular now as he been once, in the heyday of the Pre-Raphaelites: for instance, the Times reviewer of 3 October 1891 said that he "succeeded so long as he confined himself to the painting of violet draperies." But, in his obituary many years later, the same newspaper noted: "No artist ever painted spring meadows, country children, and frisking lambs, with more evident delight" — and most of these elements are present here. "Mr. A. Hughes" (obituary). Times, 23 December 1915: 6. The Times Digital Archive.Web. 26 March 2019. "Pre-Raphaelite Pictures At Birmingham." Times, 3 October 1891: 11. The Times Digital Archive.Web. 26 March 2019. Wildman, Stephen. "Hughes, Arthur (1832–1915), painter." Oxford Dictionary of National Biography. Online ed. Web. 26 March 2019.